Fall is the time to start thinking about managing this pest because the pupae that overwinter come from eggs laid in the fall. 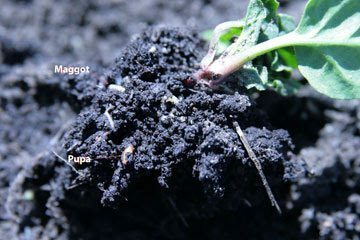 Row covers put on in the spring, just after seeding or transplanting, may keep new seedcorn maggot flies from coming into your field, but they won’t work if the pupae are already in the soil that you are covering. These flies will emerge under the cover and lay eggs that result in maggots happily feeding on your crops. To avoid this issue, avoid adding attractive organic matter (e.g., manure, lush cover crops, etc.) in the fall to soil in fields that you plan to use for early spring crops. northland sheep dairy seeking apprentice for 2018 season.